President of the Grenada Football Association Cheney Joseph has raised the Association concerns about the irrigation and drainage of the football field as well as FIFA codes relating to security at the new Football and Athletic stadium which is near completion. “These concerns were to ensure that the football aspects of the stadium met FIFA standards for hosting international matches,” states a press release from the GFA which was issued following a site visit on Monday. The visit was extended by the Minister of Sports, Hon. Emmalin Pierre. 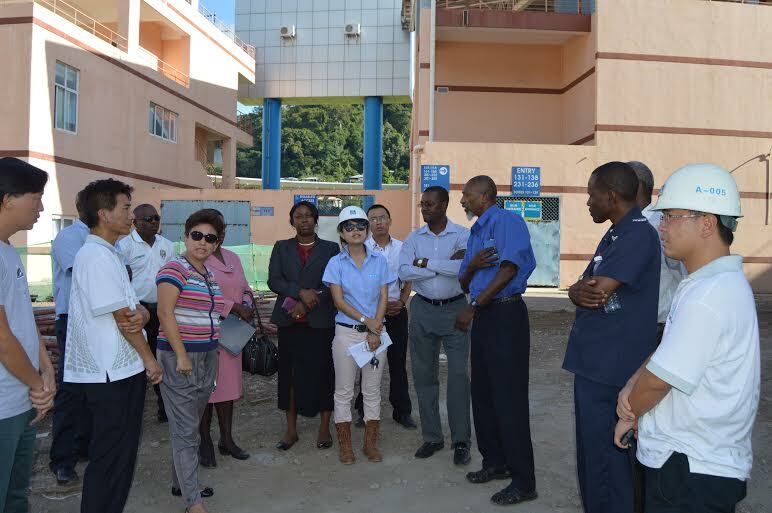 “The Ambassador of China to Grenada, Her Excellency Ou Boqian, expressed that even though the project was near completion, the concerns put forth by the Association would be taken into consideration,” said the release which said that the Association was afforded one week to provide the FIFA codes to the China State Construction Technical Personnel. Besides Sports Minister, Hon. Emmalin Pierre and the Ambassador of China to Grenada, Her Excellency Ou Boqian, other officials on the visit were Permanent Secretary in the Ministry of Sports, Mrs Theresa Bowen, Coordinator of Sports, Conrad Francis, China State Construction Technical Personnel and the GFA Delegation which comprised President, Cheney Joseph, Vice President, Allan James, General Secretary, Ambrose Phillip, Technical Director, Lester Smith, Finance Officer, Wayne Francis and Marketing and Communication Director, Malaika Church.